As promised last year, this year again the Gitanjali Mango Festival is being held, almost around the same time and ofcourse the same venue. With all your cooperation, the event was a great success last year. There were about 30,000 footfalls, 2000 kilos mangoes handled, 200 mangoes in competition, 35 varieties on sale, 100 competitions and cultural programs organized, all in the three days. Even the tourism stalls received extraordinary response. 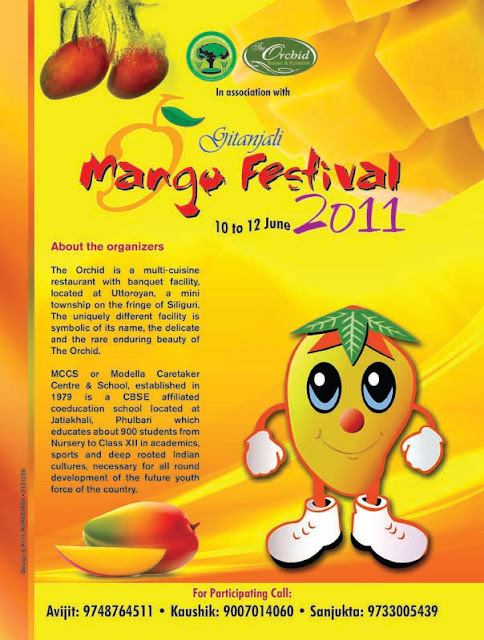 And believe it, this was the only ‘Mega Mango Event’ for East and Northeast India. As the festival was dedicated to the 150th Birth Anniversary of Kabiguru Rabindranath Tagore and 100 years of Gitanjali last year, the title Gitanjali was added to Mango Festival. The name every year will remain the same to remember the Kabiguru’s love for Mango Orchard (Amrakunja) and this year’s theme will also revolve around him and in a greater context will be ‘Epar Bangla-Opar Bangla’, the cultural ties between India’s West Bengal and Bangladesh based on Kabiguru Rabindranath Tagore. Taking into consideration, the response at the tourism stalls, this year a special travel mart will be organized, Rural Tourism Baazar, based on the theme ‘connecting heritage beyond boundaries’, which will be coordinated by Association for Conservation & Tourism (ACT). The Northeast part of India, which is connected to the country through the Siliguri Corridor or the Chicken’s Neck as it is often called shares about 98% of its borders with Tibet (China), Myanmar, Bhutan, Nepal and Bangladesh, which amounts to about 4500 kms of International border and only 02% with the country. As per the ‘Look East Policy’ of India, the success of this region lies in trade and cultural ties with the neighbouring countries and we believe rural tourism can be a major tool to achieve it. As ACT has organized 02 major policy workshops based on cross-border tourism, the responsibility has been left to them. The Mango Exhibition and Competition, Mango Eating Competition, Cookery Classes and Mango Recipe Competition, Seminars, Sit & Draw, Picture Postcard Art, Picture Story Writing, Mango Quiz, Ethnic Dress Competition, Face of the Day, Cultural Programs will continue like last year. The new activities which will be added would include Alpana Competitions (revival of a old domestic art form of Bengal), Poster Exhibition based on Heritage Sites of Bengal, A Trio of Films from Shekhar Das will be video projected by the Director himself who will be available for interaction, Ajoy Roy’s documentaries of Bengal and India’s Northeast will be projected by the maker himself and more surprises to come during the Festival. 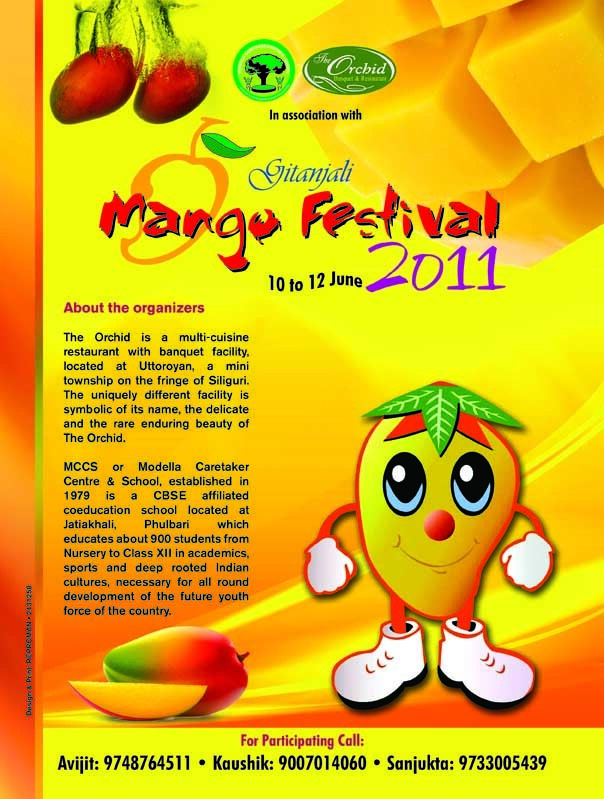 We shall meet again on the 5th of June, 2011 at 3PM (15:00 hrs) for the Reception Rituals of the Festival with plantation of Mango Trees at the venue, The Utsav, Uttorayon, Siliguri.